The philosopher, logician and peace activist Bertrand Russell lived for almost a century, with his life spanning from the late-nineteenth to the mid-twentieth century. He grew up in Britain at the height of its empire, and lived through much of the twentieth century’s major upheavals including two European world wars, the rise of communism, women’s emancipation, America’s rising imperialism and the cold war. By the age of 40 Russell was deeply involved in political movements. Russell’s achievements in philosophy and logic had given his opinions on broader political and contemporary issues deeper significance. Many of these opinions concerned both science and religion. Although Russell gave up his Christian faith in childhood, he continued to write about religion as well as moral, ethical, and scientific questions in books and essays such as Mysticism and Logic (1917), “Why I am not a Christian” (1927), The Scientific Outlook (1931) and Religion and Science (1935). The media, including many British newspapers and BBC radio and television programs, sought out Russell’s perspective on many topics including those on science and religion. Nicholas Griffin, professor of philosophy at McMaster University in Hamilton, Ontario, Canada, has devoted the better part of his career to the study of Russell, particularly the development of Russell’s philosophical work. Griffin is Director of the Bertrand Russell Research Center, and has supervised the editing and publication of Russell’s collected papers. Throughout his career Griffin has worked with the Russell Archives at McMaster, an amazing historical resource encompassing 40,000 of Russell’s letters, original manuscripts, objects and materials. SN: What is Russell’s most important work on religion? Can you describe the view on religion Russell argues for in this work? NG: From a philosophical point of view I would have to say his most important work on religion was “On Denoting”, his theory of definite descriptions. The reason for that is that it is his only really original contribution, although indirectly, to the philosophy of religion. Its impact on religion has to do with the ontological argument for the existence of God, a traditional argument from medieval times, which Kant had famously attacked by saying that it depended upon viewing existence as a predicate when in fact existence wasn’t a predicate. What Russell did in that paper was to provide the standard way [within modern logic] that we have now of understanding what existence is if it is not a predicate. The ontological argument runs something like this. God is the greatest conceivable being. To conceive of a being as having existence, is to conceive of a greater being than to conceive of a being that has all the same properties but lacks existence. Therefore God, if he can be conceived at all, must exist, because he would then be the greatest being, and the greatest being would have to have the property of existence on top of all the others. There is obviously some subterfuge and sleight of hand, something has obviously gone wrong with that argument, because by the same token you can prove that there was a greatest rabbit. It would be the rabbit which had all rabbitly perfections, and then would have to have existence on top. But it wasn’t clear until Kant came along what was wrong with it. Kant said that it treats existence as if it were just another property like all the others, whereas in fact the property of existence is quite different. Russell in “On Denoting” explained that difference by showing how existence was to be expressed by quantifiers rather than by property expressions or predicates. That’s the philosophical answer. That’s Russell’s only original contribution to philosophy of religion. Religion and Science was probably his best work in this area, because it was the most extended and considered. But that wasn’t the most influential, because it was hardly ever reprinted. The works that had most influence were the essays that went into Why I Am Not A Christian, which was published in 1957. Many of those essays were in print and republished in various collections for a long time and had a good deal of influence. I think their influence was to preserve the nineteenth-century tradition of freethought through the twentieth century. There is not much that is really very modern in them. He does not address movements in twentieth century theology, like demythologization or existential theology. It is very much traditional theology that he attacks, and he attacks it with arguments that are by and large traditional arguments. SN: The Wikipedia article on Russell describes his view on religion as agnostic or atheist, concluding: “For most of his adult life, Russell maintained that religion is little more than superstition and, despite any positive effects that religion might have, it is largely harmful to people. He believed that religion and the religious outlook serve to impede knowledge and foster fear and dependency, and are responsible for much of our world’s wars, oppression, and misery.” Is this a correct summary of his attitude towards religion, in your view? NG: I think it is pretty accurate. He was often asked the question of whether he was agnostic or atheist. There are lots of letters in the archive where people write to him to ask him this question, and in his replies he typically said that he was an agnostic. I think the reason for that was that he had very high standards for knowledge. The atheist would be someone who claims to know there is no God. That for Russell would require a proof. He always said he denied that he could prove that God didn’t exist, but he thought that there was no evidence whatsoever to support the view that God did exist. His arguments against religion are a bit different from the nineteenth century ones. The nineteenth century arguments against religion tended to question it on scientific grounds, but say nonetheless that religious morality was crucial, was really important, and just because God didn’t exist it doesn’t mean we shouldn’t behave like Christians. Russell on the other hand thought that it would be better if we didn’t behave like Christians. That doing so would make us more kindly to one another, less bigoted, less judgemental and less oppressive. On the other hand, he did think that there was something which he sometimes referred to as a religious attitude towards the world that he did value. That emerged around 1910, 1911, when he started to look at the idea of a non-creedal religion. He was not unique at that time in looking at non-creedal religion. Tolstoy was moving in that direction. It was something of a trend. Russell continued his role as a political campaigner well into his eighties. 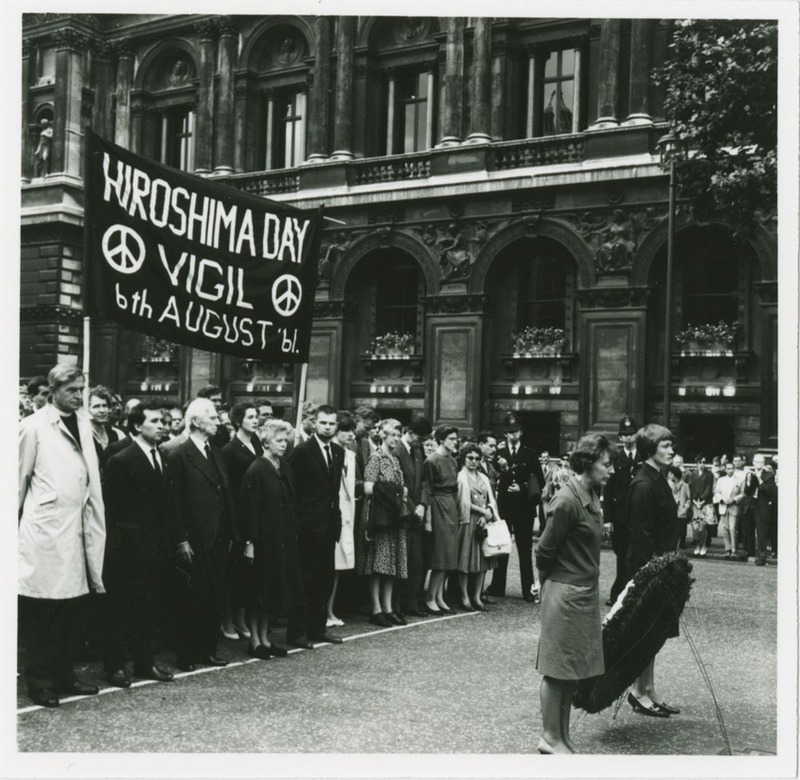 Here he is depicted (below banner, with wife Edith to the right) at a march for nuclear disarmament on “Hiroshima Day Vigil, 6 August 1961”. Following the march and speech he gave that day, Russell and Edith served seven days in prison for refusing to keep the peace. (Image courtesy: McMaster University Libraries). Beliefs that were associated with religion had become untenable. But it was thought that if you take the beliefs out of religion then you were left with a religious attitude toward things. Russell did tend to think that was a good thing. It was not associated with organized religions or with churches, and obviously not with any specific doctrines. But as an attitude to the world, an attitude of reverence and wonder, and a sense of human finitude, of smallness and fragility against the universe, that was something that he valued, but was he thought difficult to achieve without something like religion. If you’ve got the religious beliefs, it’s much easier to take that attitude towards the world. If you don’t have them, you have to find some other source for it. The essays in which you find these views are “The Essence of Religion” (1912) and Mysticism and Logic (1917). SN: In Russell’s 1935 book Religion and Science, Russell has a problem dispensing with religion altogether because of confronting the construction of a secular code of ethics for controlling science. Can you describe what role Russell envisioned for the governance of science within his view of a secular society? NG: The question about society and ethics and science, that’s a tangled relation. Russell was very concerned about what science could do in the wrong hands. He was also for most of his career a non-cognitivist about moral issues. His attitude varied a bit and I am simplifying it, but his attitude was roughly that moral judgements did not attribute properties to actions. If you judge some action as wrong or right, you weren’t saying that it had some property or characteristic, you were condemning it or praising it. It was an expressivist view. This gave him some trouble as he had very strong moral convictions about all sorts of things! He found it very difficult to believe that the only thing to be said against some of the evils of the world was that he disapproved of them. Expressivism was not a terribly happy moral position to have. But at least we can say that Russell never let it restrict his expression of moral sentiments, which he did frequently. He found a special problem with society and science because of the difficulty of instituting democratic control. He was a liberal democrat, he believed that generally governments should be subject to democratic control, and that democratic control would generally be a good thing, though he recognized cases in which it wouldn’t, when the public would be swept away by enthusiasms to wars and persecutions in democratic states. But he thought that on the whole, although democracy wasn’t perfect, it was better than the alternatives. The difficulty for him with science was that while democracy could be an effective control, it was not necessarily the best control. The reason for this is that people were just not well informed enough about the scientific issues that went on in the management of science. It would be little use to have a referendum on whether the Human Genome Project, for example, was worth undertaking. So the usual democratic role for controlling social enterprises wasn’t necessarily a good one for controlling science. That left him with a quandary as to how science should be controlled, and how it should be geared towards public ends. SN: What influence, in your opinion, did Russell have in Britain and globally, through his popular writings, media appearances and press coverage, with respect to his views on religion? NG: Well he had a considerable influence on the opinions of all sorts of people myself included. Why I Am Not A Christian was one of the works I read in school and took courage from. Britain was a place with established religion and we had prayers each day in school, school was a fairly religious organization. Russell kept the pressure up on that in a way. Freethought had begun as a popular movement in Victorian times, Russell was well aware of it, was influenced by it when he was growing up, and he continued the influence writing pamphlets. When I was young in Britain it was easy to find copies of his pamphlets still being sold by various secular organizations in Britain, the Humanists, the National Secular Society, the Rationalist Press Association, they all had Russell texts on hand that they distributed. So he was quite influential in that. In various other movements that were associated with the decline of religious control of social and moral life, secular reform for example. He was a strong advocate there on things like birth control. He wasn’t so far as I know involved in movements to legalize abortion, but he was involved in homosexual law reform. Which while not in themselves religious issues the other side tended to be supported by religious movements. So he had a popular role in the secularization of British society through the twentieth century by writing and also by broadcasting. He spoke of these things on TV and was quite possibly Britain’s best known atheist, or agnostic, for a large part of the twentieth century. SN: Do you have any other thoughts you wish to share about how Russell was important to how our attitudes about science and religion have changed over the course of the twentieth century? NG: Russell’s attitudes towards religion are quite clear-cut. However, his attitudes towards science are very complicated and deserve more study. There is a book waiting to be written on that topic, I think. The full interview with Professor Griffin appears in the Fall 2015 issue of the Bertrand Russell Society Bulletin, a copy of which can be found here. The full transcript discusses Russell’s conception of the scientist, government control of science, and Russell’s philosophy of mathematics.